I know that I've said it before, but I love the Pillow Talk Swap. This round in particular, I love that my partner was very vague and open minded so I could pretty much go whichever direction seemed right. I was pretty sure that I wanted to do some paper piecing, so I was looking around flickr for some ideas when I saw this block (she has some other great ones too). The wonky border around he star really sold me. 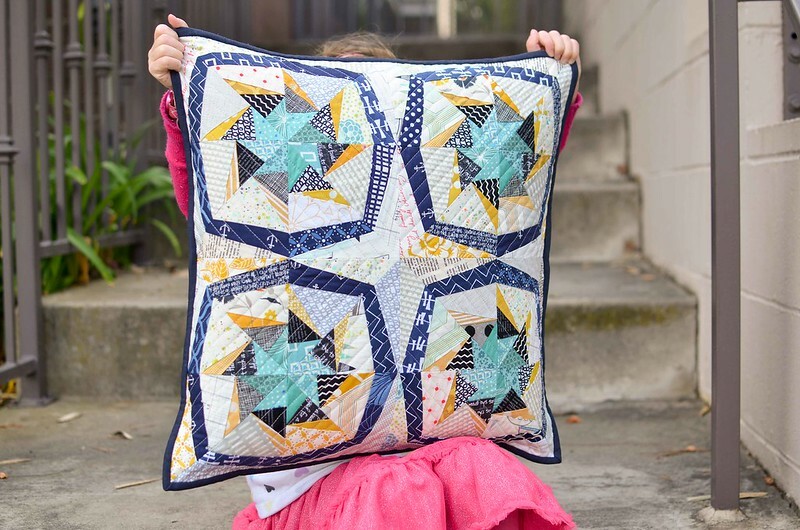 I think my favorite thing about the finished pillow is the star shape that the blocks created in the middle once they were sewn together. I did shrink down the pattern a little bit (down to 80%) so the finished size of the pillow is about 19" square. It is bound with Essex linen in navy. 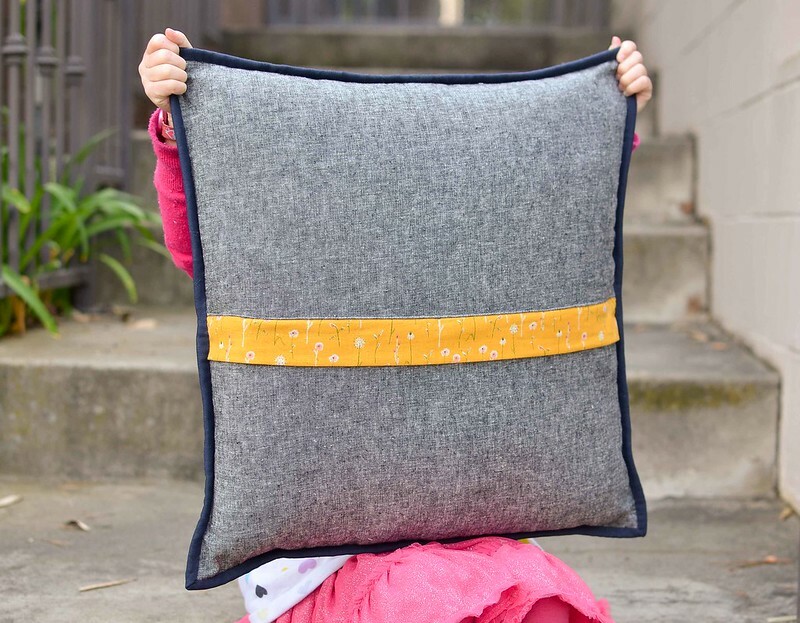 The back of the pillow is essex yarn dyed linen in black and the zipper is hiding under the flap thanks to this tutorial (this is my favorite way to finish pillows). I hope my partner loves it as much as I loved making it! absolutely stunning, Erica. You did an amazing job, your partner is so lucky. Hope you get an amazing pillow too. It turned out beautifully Erica! Looking forward to seeing what you receive too. I am totally in love with your pillow. I love everything about it. I really want to try to make one like it. 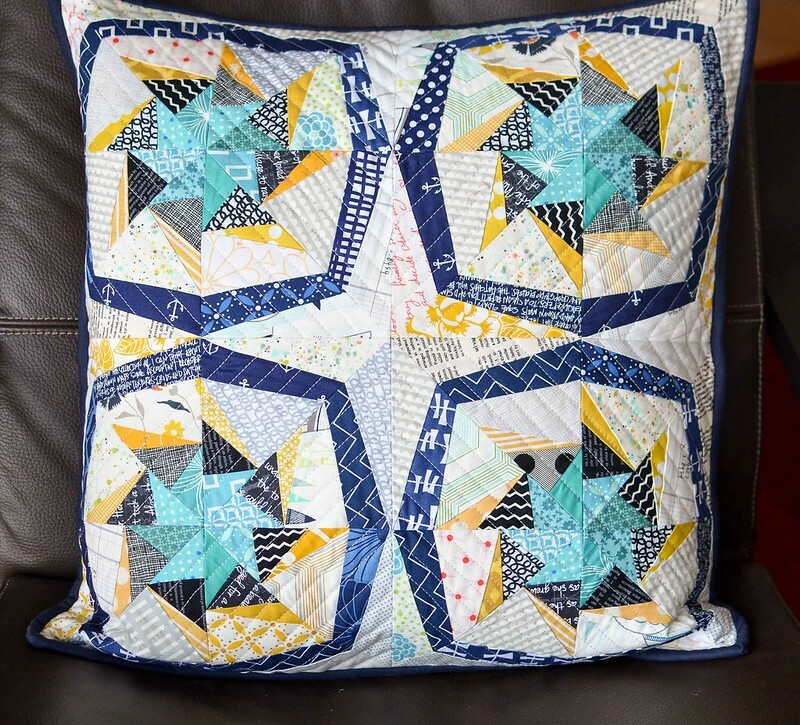 Beautiful pillow and thanks for sharing the link! Loving everything about this. You've inspired me to make some pillow covers soon. LOVE your fabric choices. Wish this was mine! I do love this pillow, so maybe I will be your partner!!?? Wowza Erica! That is one gorgeous pillow! Lucky partner! Brilliant, and beautiful. I, too, like the secondary star pattern that pops up in the middle. Love it! Really love this! SO nicely done. I love your pillows. They are always fun and amazing! Now I am going to go look at that zipper tutorial. I am making a pillow and have been debating how to do the closure.